Home / Estate Planning / Spring Cleaning: When Can You Purge Your Old Financial Records? Feeling the urge to purge? April 18, 2017, was the deadline for individuals and C corporations to file their federal income tax returns for 2016 (or to file for an extension). Before you clear your filing cabinets of old financial records, however, it's important to make sure you won't be caught empty-handed if an IRS auditor contacts you. E-filing is on the upswing. According to the Data Book released by the IRS in March, about 69% of tax returns were filed electronically in fiscal year 2016, up from about 65% in fiscal year 2014. You might think those numbers suggest we're close to becoming a paperless society, at least when it comes to filing income taxes. That would be a wrong assumption. Even if you recently filed your 2016 tax return electronically, you probably printed out a hard copy for your files. 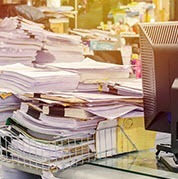 Add that paper to the financial reports, bank statements, receipts and other documents you may have been holding onto for years and it's likely your filing cabinets and closets are overflowing with paper. In general, you must keep records that support items shown on your individual tax return until the statute of limitations runs out — generally, three years from the due date of the return or the date you filed, whichever is later. That means that now you can generally throw out records for the 2013 tax year, for which you filed a return in 2014. So, does that mean you're safe from an audit after three years? Not necessarily. There are some exceptions. For example, if the IRS has reason to believe your income was understated by 25% or more, the statute of limitations for an audit increases to six years. Or, if there's suspicion of fraud or you don't file a tax return at all, there is no time limit for the IRS to launch an inquiry. Here are some basic guidelines for individuals. Completed tax returns. Many tax advisors recommend that you hold onto copies of your finished tax returns forever. Why? So you can prove to the IRS that you actually filed. Even if you don't keep the returns indefinitely, you should hang onto them for at least six years after they are due or filed, whichever is later. Important note: There are some cases when taxpayers get more than the usual three years to file an amended return. You have up to seven years to take deductions for bad debts or worthless securities, so don't toss out records that could result in refund claims for those items. Real estate records. Keep these for as long as you own the property, plus three years after you dispose of it and report the transaction on your tax return. Throughout ownership, keep records of the purchase, as well as receipts for home improvements, relevant insurance claims and documents relating to refinancing. These help prove your adjusted basis in the home, which is needed to figure the taxable gain at the time of sale, or to support calculations for rental property or home office deductions. Securities. To accurately report taxable events involving stocks and bonds, you must maintain detailed records of purchases and sales. These records should include dates, quantities, prices, dividend reinvestment and investment expenses, such as broker fees. Keep these records for as long as you own the investments, plus the statute of limitations on the relevant tax returns. IRAs. The IRS requires you to keep copies of Forms 8606, 5498 and 1099-R until all the money is withdrawn from your IRAs. With the introduction of Roth IRAs, it's more important than ever to hold onto all IRA records pertaining to contributions and withdrawals in case you're ever questioned. Issues affecting more than one year. Records that support figures affecting multiple years, such as carryovers of charitable deductions, net operating loss carrybacks or carryforwards, or casualty losses, need to be saved until the deductions no longer have effect, plus seven years, according to IRS instructions. The record-retention guidelines are slightly different for businesses. Here are the basics. Timecards specifically must be kept for at least three years if your business engages in interstate commerce and is subject to the Fair Labor Standards Act. However, it's a best practice for all businesses to keep the files for several years in case questions arise. Employment tax records. Keep four years from the date the tax was due or the date it was paid, whichever is longer. Travel and entertainment records. For travel and transportation expenses supported by mileage logs and other receipts, keep supporting documents for the three-year statute of limitations. Sales tax returns. State regulations vary. For example, New York generally requires sales tax records to be retained for three years, while California requires four years, and Arkansas, six. Check with your tax advisor. Business property. Records used to substantiate the cost and deductions (such as depreciation, amortization and depletion) associated with business property must be maintained to determine the basis and gain (or loss) on the sale. Keep these for as long as you own the asset, plus seven years, according to IRS guidelines. Regardless of whether you're tossing out personal or business financial documents, always shred them thoroughly first. Also, use proper disposal protocol for any computers and other electronic equipment (such as printers and copiers) that may contain financial data. Simply deleting files using File Manager isn't enough. Unless you use proper disposal protocol, tech-savvy hackers may be able to recreate sensitive data from the device's hard drive when it was thrown out, donated to a charity, or returned to the lessor after the lease term expired. If you have any questions regarding financial records retention, contact your tax advisor for more information. These tax tip articles are very informative without being verbose. They are easy to read in plain English. Keep up the good work. Another unexpected benefit of dealing with AmeriEstate.